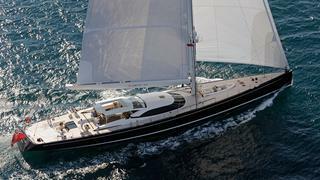 The 44.7 metre sailing yacht Lady B has been sold with Burgess acting for both the buyer and seller. Built in aluminium by Dutch yard Vitters to a design by Dubois Naval Architects, she was delivered in 2010 and went on to win a Judges’ Special Commendation at the 2011 World Superyacht Awards. Lloyds classed and MCA compliant, her bright and airy interior by Rhoades Young features walnut joinery and light fabrics. Lady B accommodates up to eight guests in four cabins consisting of a master suite, a double and a convertible twin with a Pullman berth, along with a dual purpose study that converts into a further guest cabin. A stunning, curved skylight in the owner’s suite leads out to a private cockpit. A notable feature is a custom two-person crow’s nest that travels 39 metres up the mast. Lady B has a large split-level saloon with panoramic views, U-shaped seating and a writing desk in the upper level while below there is more seating in front of an entertainment system to starboard and a dining table to port. The slim profile of this sailing superyacht features a single-level superstructure to keep the weight down. Lady B has a high aspect ratio rig with a Southern Spars carbon mast and furling boom, and is equipped with PBO standing rigging to enhance performance. She has a lifting keel that enables a variable draft from four metres to six metres. Under power, a Caterpillar C-18 engine gives her a cruising speed of 12 knots. This marks the 8th sale in the 35 metre+ sailing yacht sector for Burgess in 2016. Lying in the South of France, Lady B was asking €17.9 million.